Today is Janmashtami, Lord Krishna’s birthday. Celebrations will begin at the temples here in the evening with abhishek, kirtan, drama and prasad. 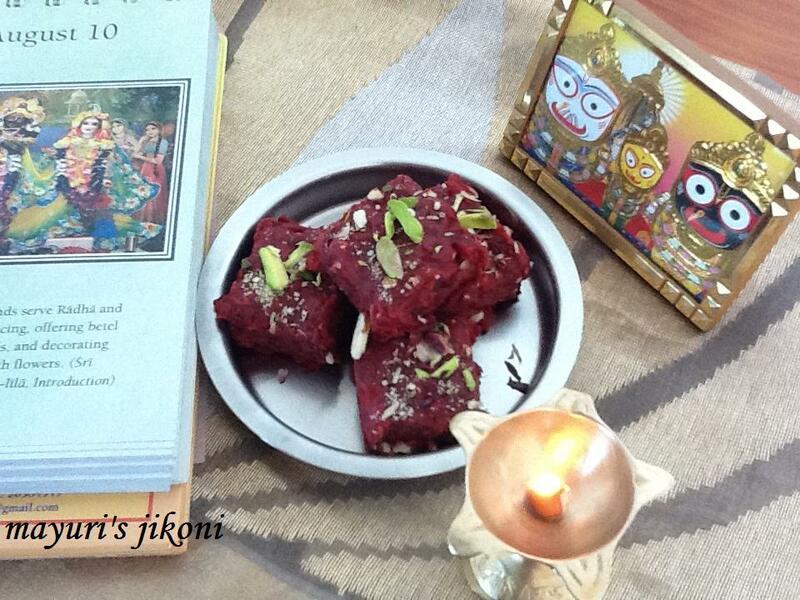 I feel bad that I was not able to prepare a lot of dishes to offer to Lord Krishna simply because I did not pre-plan. When Nunu was living in Mombasa,we would plan who would make what and how many offerings there would be. We would make anywhere between 7 to 11 dishes or more. When she left for India, I use to make at least 3 to 5 but this year I have managed only 1. Hopefully next year with a bit of planning I will be able to make more offerings. However as the saying goes, whatever is offered with your heart God accepts. This year I tried out a new recipe and made this simple halwa for offering. Mix the cream into the milk powder. Sieve the mixture to get fine crumbs.Break down the lumps using a spoon. Heat 2 tbsps of ghee in a pan over medium heat. I prefer using non stick pan. Add the grated beetroot and saute. Let it cook for 5 to 10 minutes over medium heat. Stir occasionally to avoid the mixture from getting burnt. Add half a cup of milk and let it cook for a further 5 minutes. Add the remaining milk, sugar and milk powder mixture and mix well. Keep on stirring and cook till the milk evaporates and the mixture leaves the sides of the pan. The mixture should come together in the middle when you stir. Add the remaining ghee and mix till the halwa becomes glossy. Serve immediately or let it set in a greased tray. If serving immediately, add the nuts and mix. If setting it in a tray, sprinkle the nuts on top. It will take a few hours to set. I was in a bit of a hurry so I let it set in the fridge. Grease your hands and roll into balls if you like. If you like extra sweetness, use ½ cup of sugar. This halwa remains pretty soft and does not set like a burfi. Reduce the amount of ghee for a healthier option. Thank you – a very useful idea. Is beetroot considered farali? ?